For Women after 50! ~ Financial Freedom, Fulfillment and Fun! Are you a woman 'after 50' doing what you love? Are you creating the life you desire, filled to the brim with financial freedom, fulfillment and fun? If you are congratulations and a Rebel Belle Yell! Keep doing what you love. 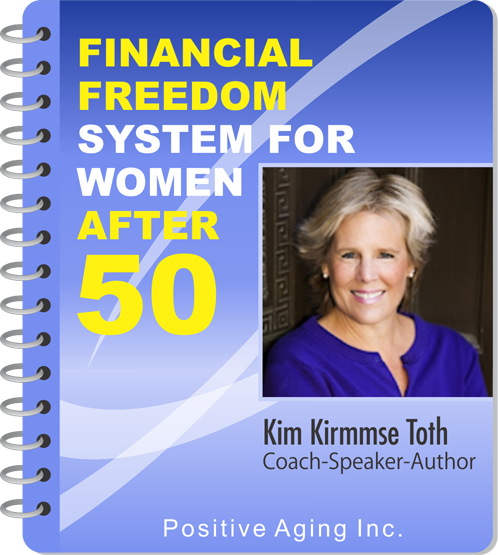 The Financial Freedom System for Woman after 50 TeleSummit Event. knows first hand how women struggle in retirement, especially when it comes to finances. The statistics are devastating. • Women in retirement do not fare well financially. • A 65 year old woman has a life expectancy of 20 more years. Now, imagine feeling confident and secure in knowing exactly how to make your 'golden years' FABULOUSLY golden. You can! 16 Brilliant and Dynamic women have come bearing gifts. They are here to share their expertise, talents and life experiences with you, so you can feel safe, sane and secure in your retirement years and financial future. Join Kim Kirmmse Toth and her 16 featured speakers (including Moi') for a fun, informative and inspirational event. If you would like to bask in self confidence, feeling balanced and empowered to run your life and business today, and long after you're 50, you must join this FREE event. Give yourself the gift of financial freedom, fulfillment and fun! !